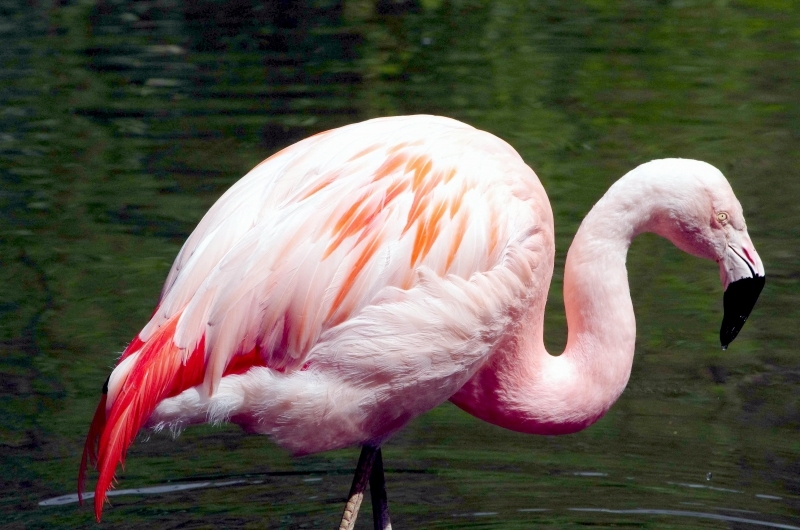 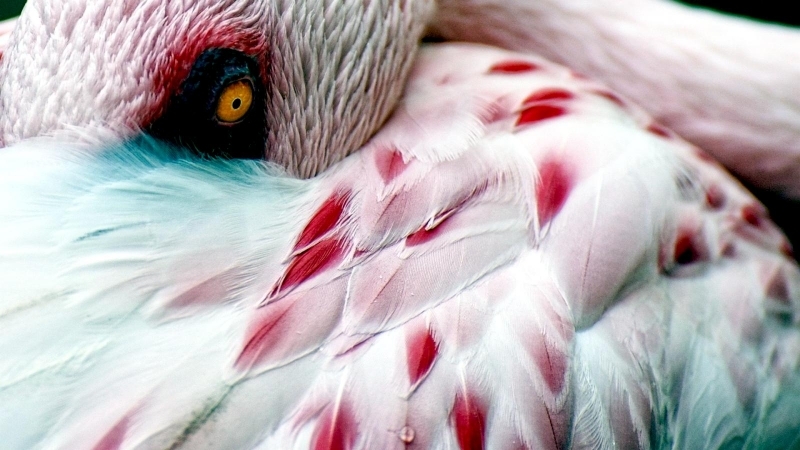 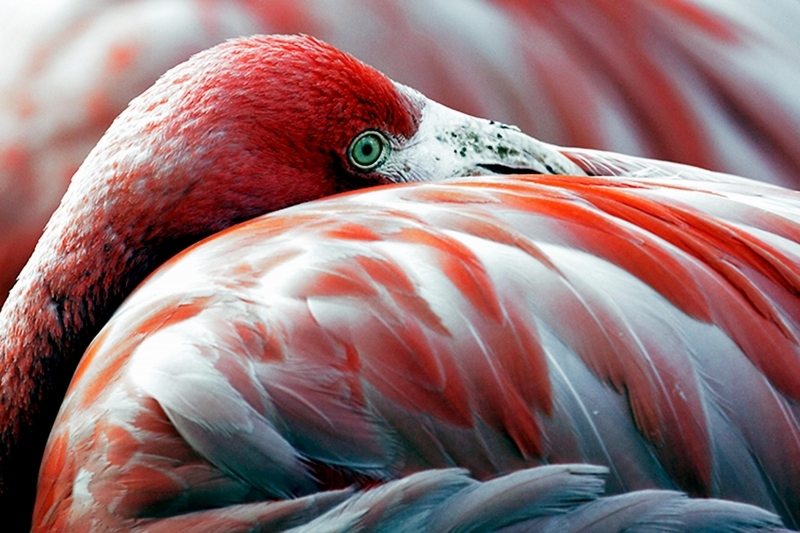 The Flamingo is a well-recognized bird because of its red-purple colored feather. 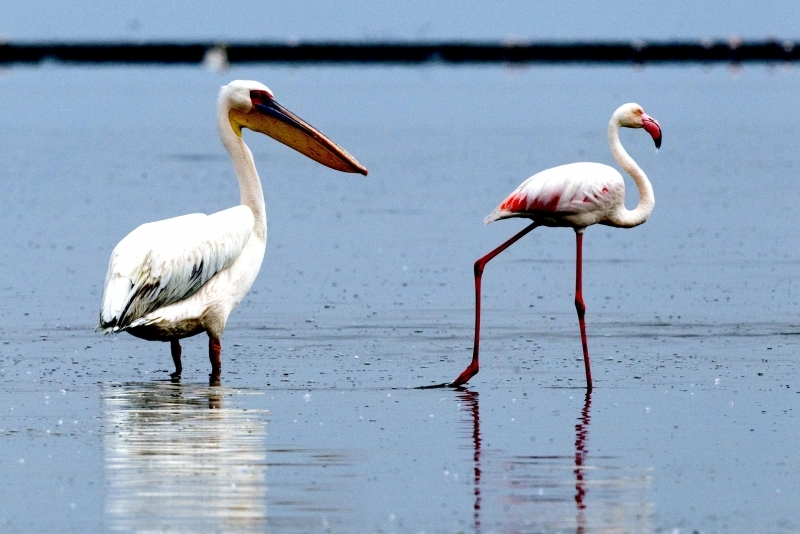 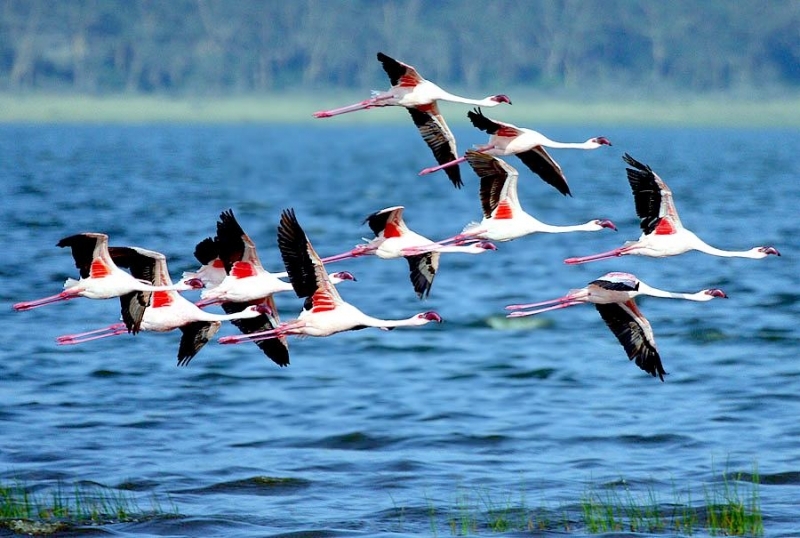 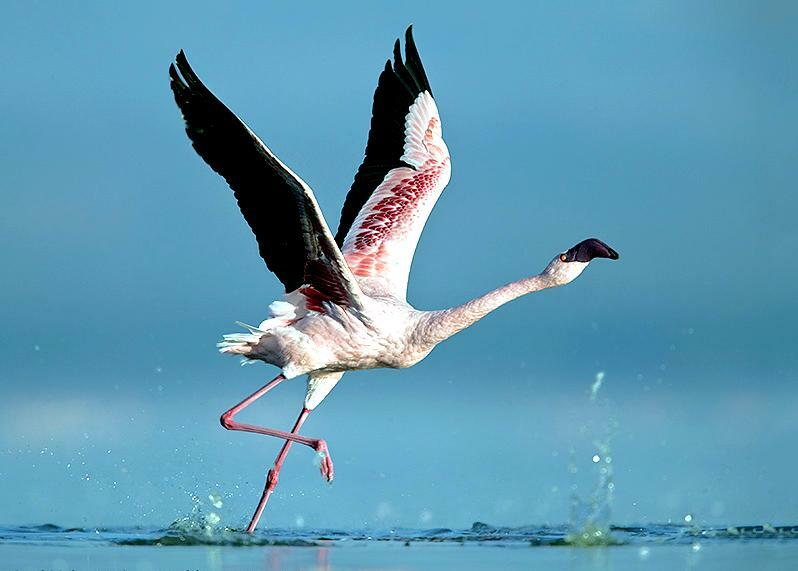 These birds live in shallow lakes, mangrove saltwater swamps, coastal regions and sandy islands of Africa, Asia, North, South & Central America and Europe. 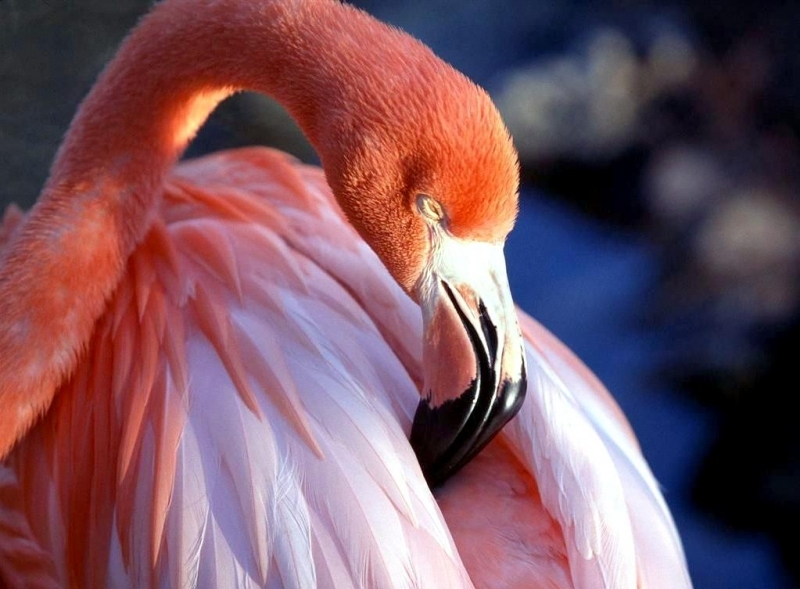 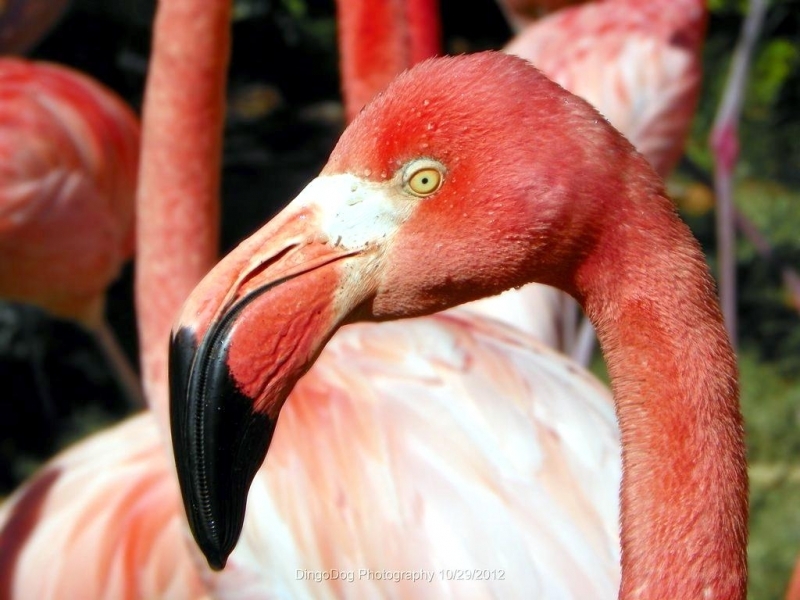 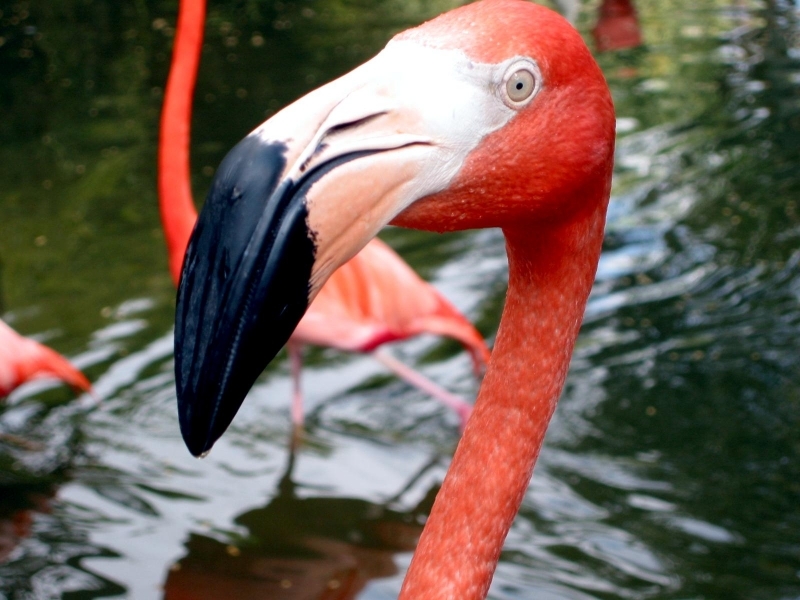 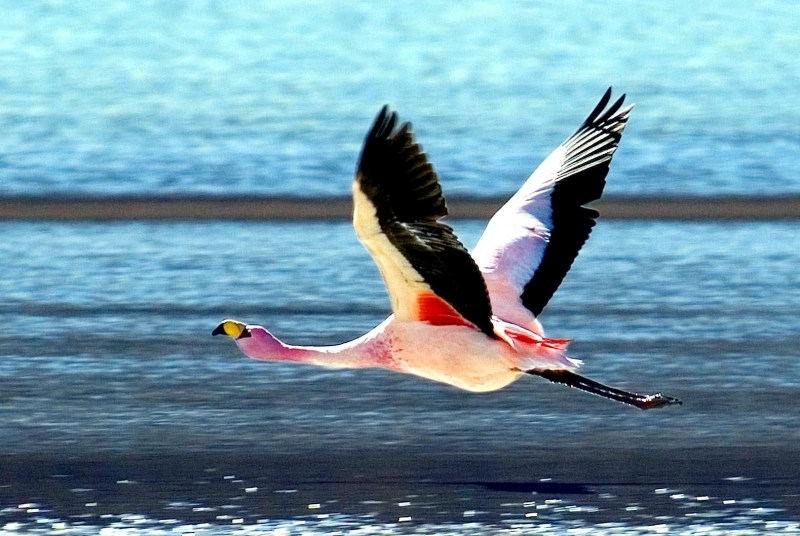 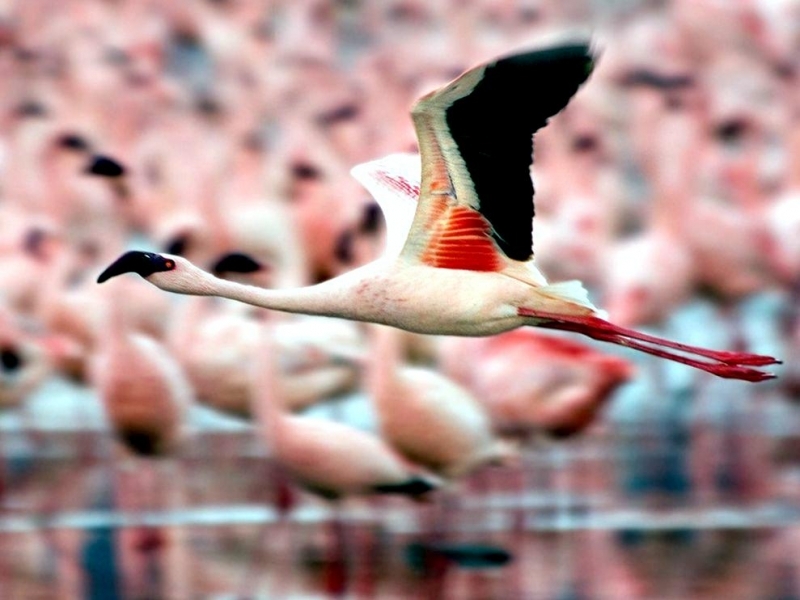 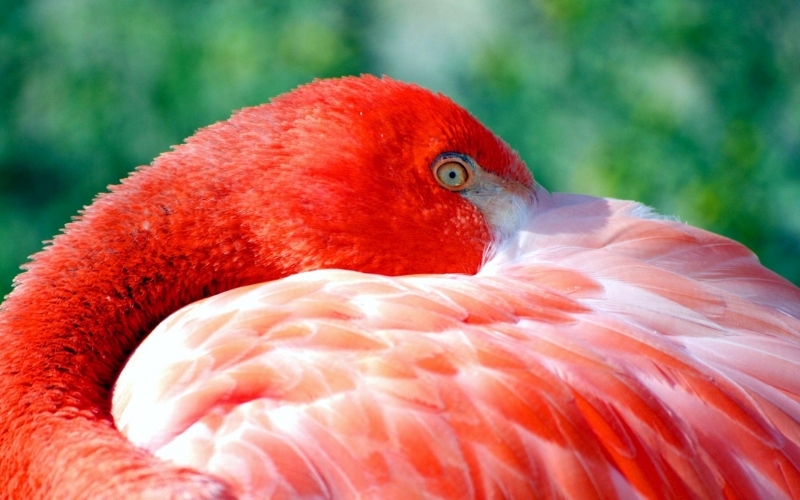 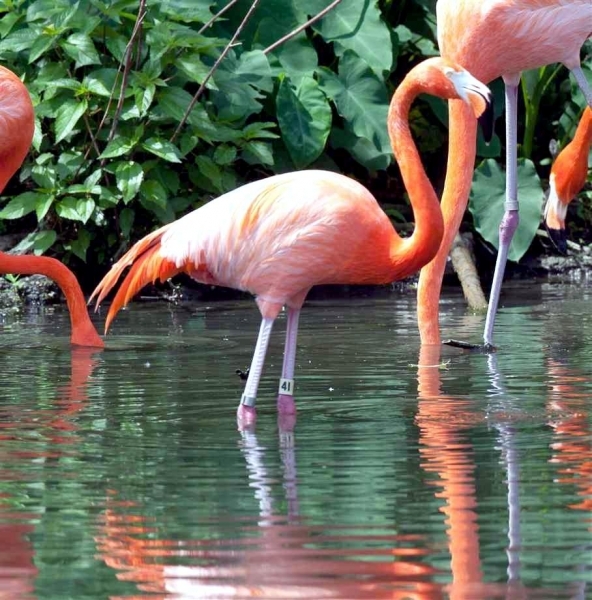 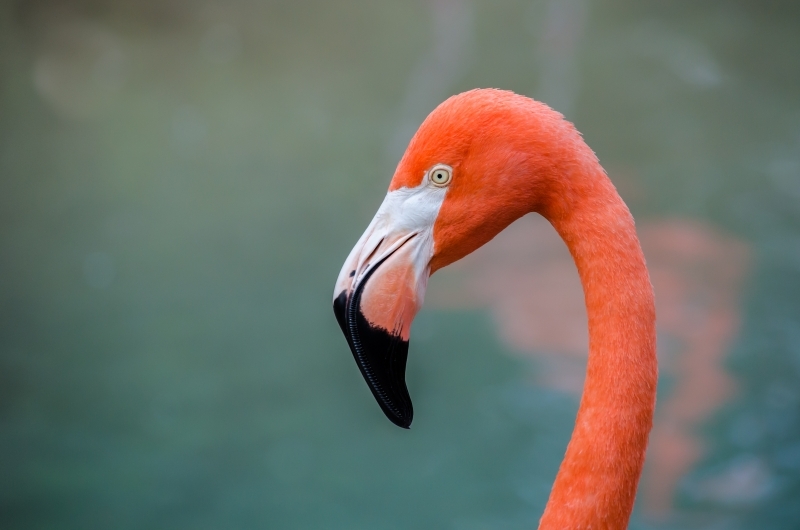 Flamingos are famous for their bright pink feathers, stilt-like legs and S-shaped neck. 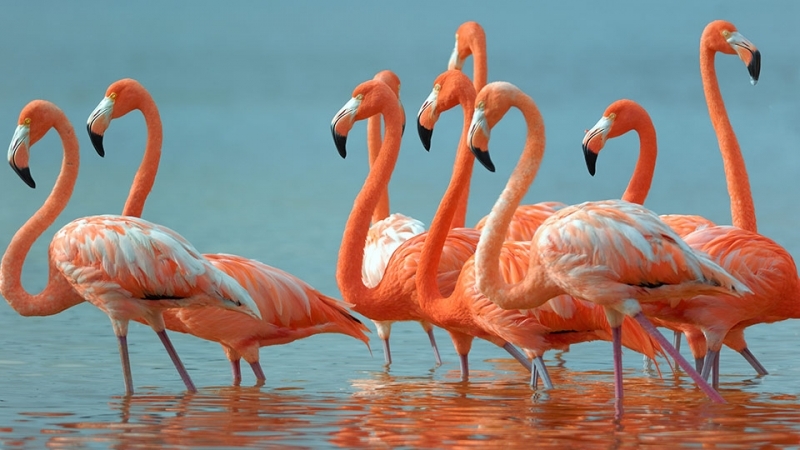 Flamingo means “flame” in Latin. 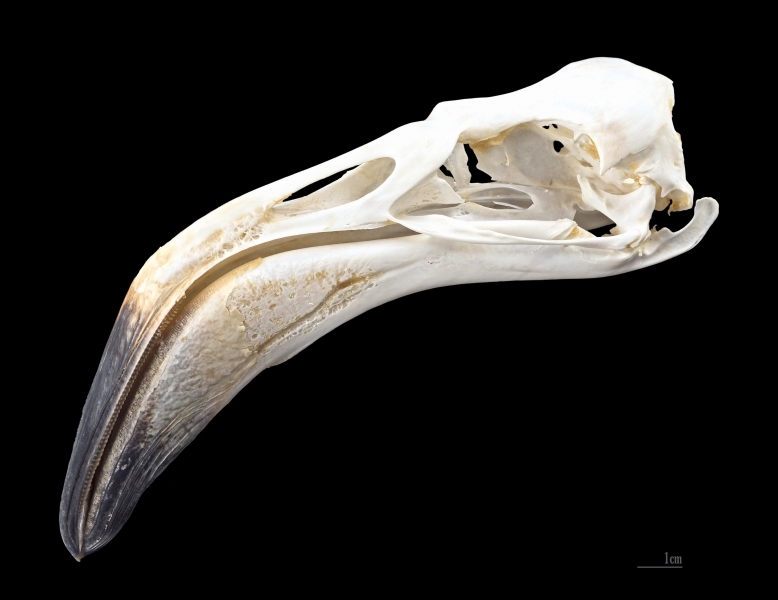 Ancient Greeks worshiped them as their sun god “Ra”. 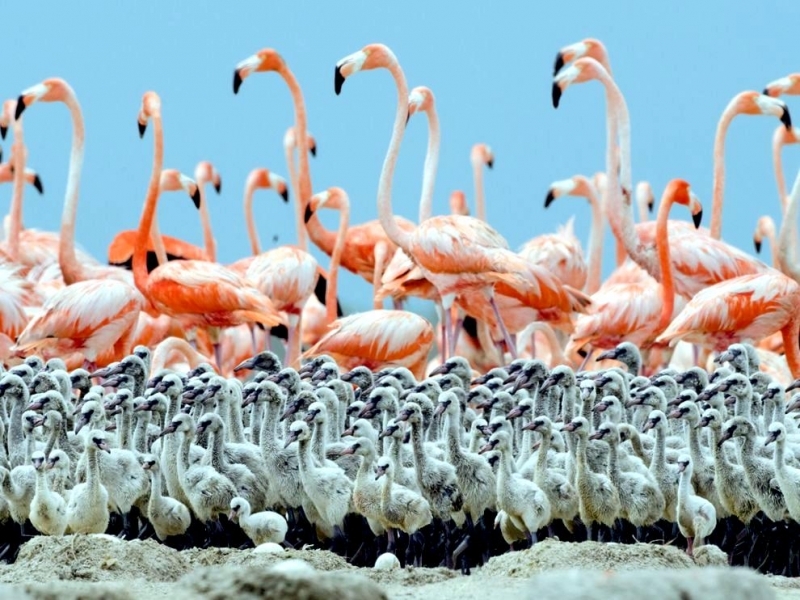 Seeing the Flamingos, they would of connected the sun god to the brilliant & vibrant coloring of the birds and naturally associated them together. 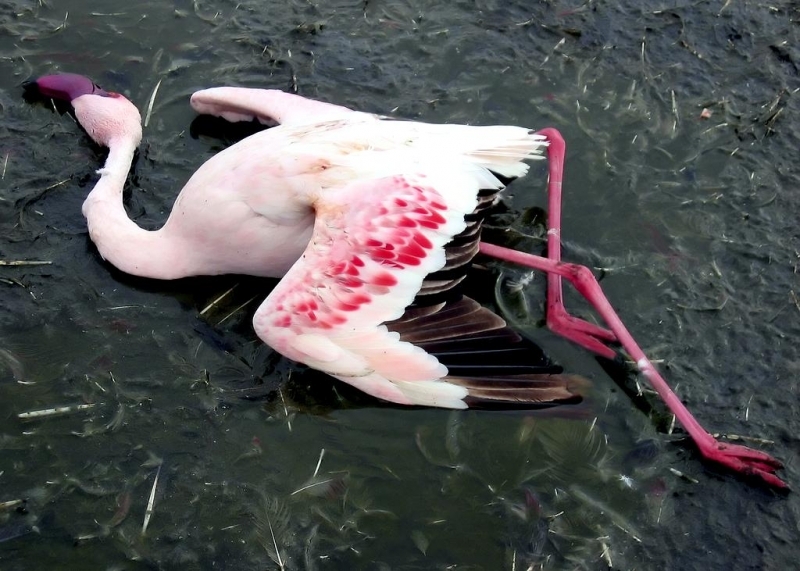 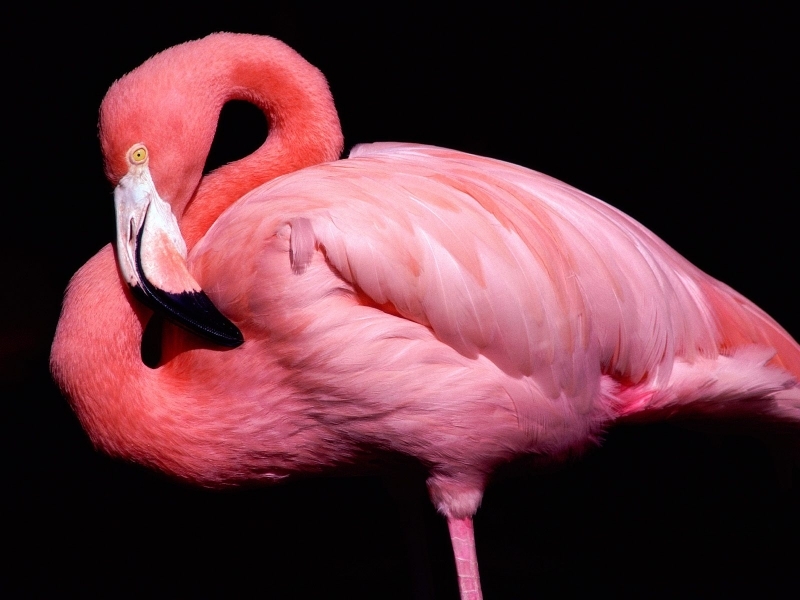 When a Flamingo spots potential dinner including shrimp, snails, fish and algae, it plunges its head into the water, twists it upside down and scoops the meal using its upper beak like a shovel. 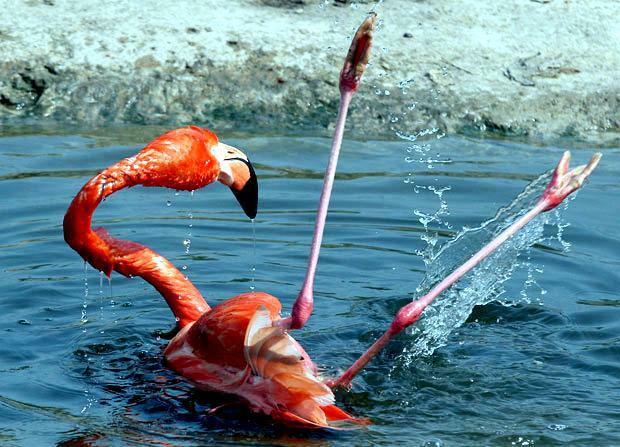 They are able to “run” on water thanks to their webbed feet, to gain speed before lifting up into the sky. 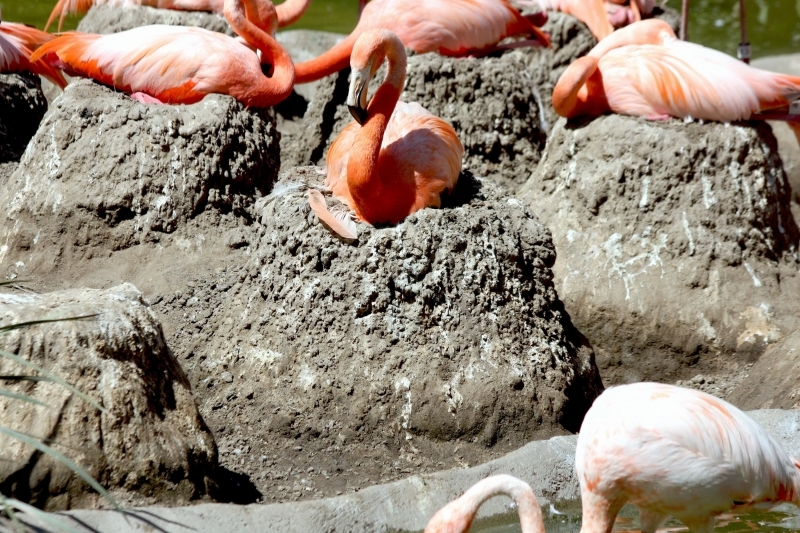 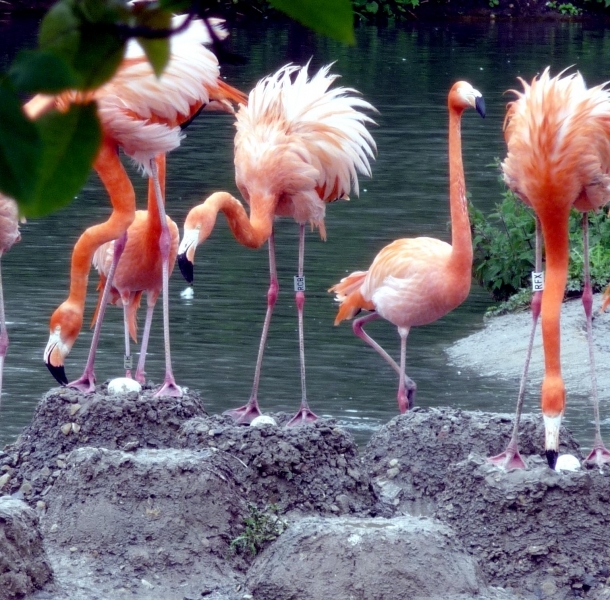 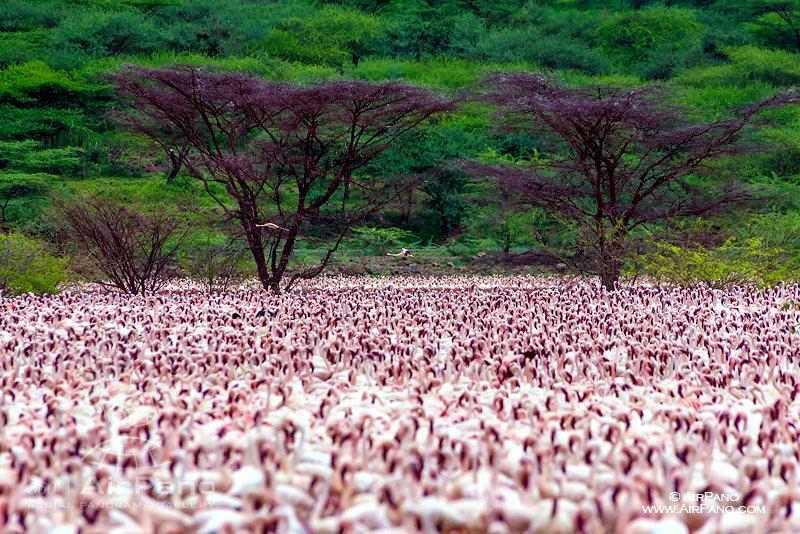 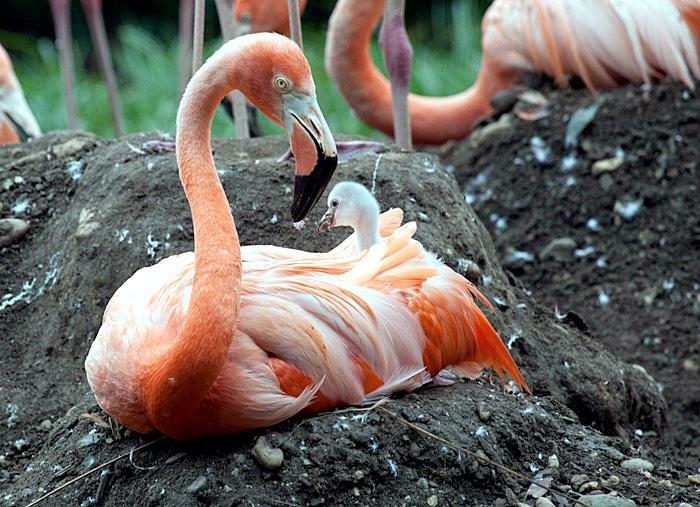 Flamingos build nests that look like mounds of mud along waterways. 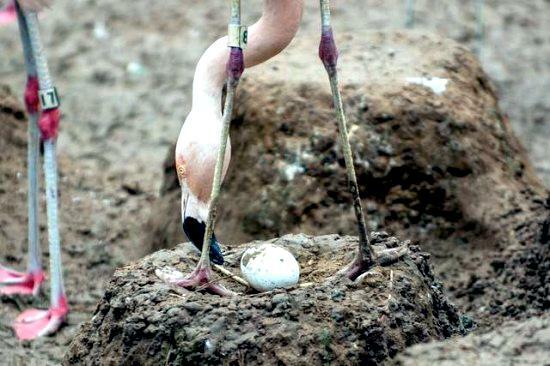 At the top of the mound in a shallow hole, the female lays 1 egg. 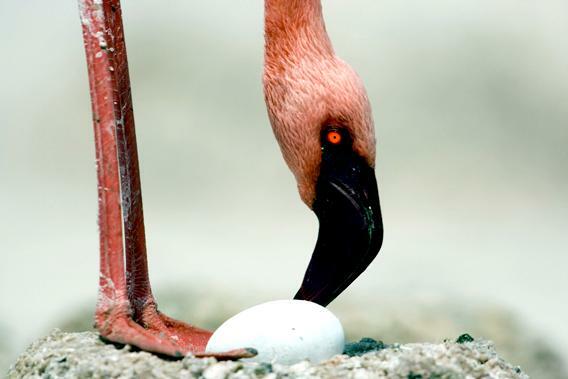 The parents take turns sitting on the egg to keep it warm. 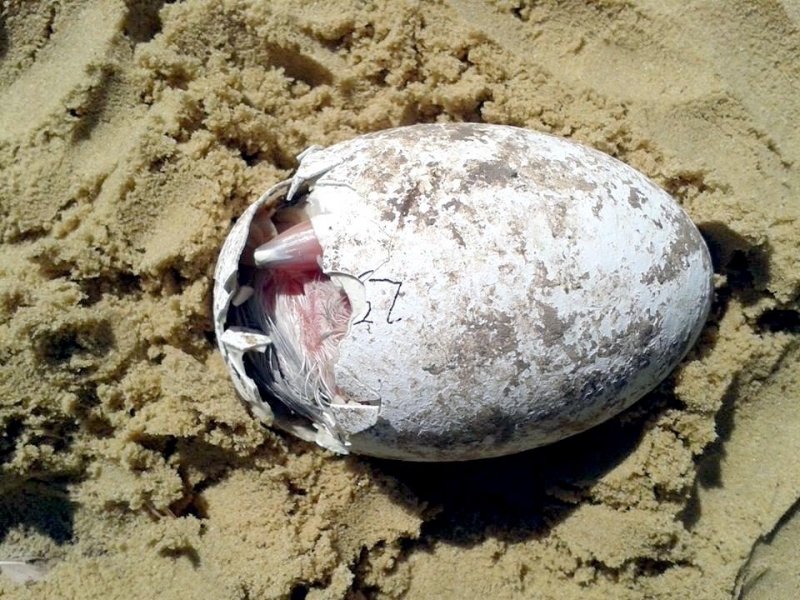 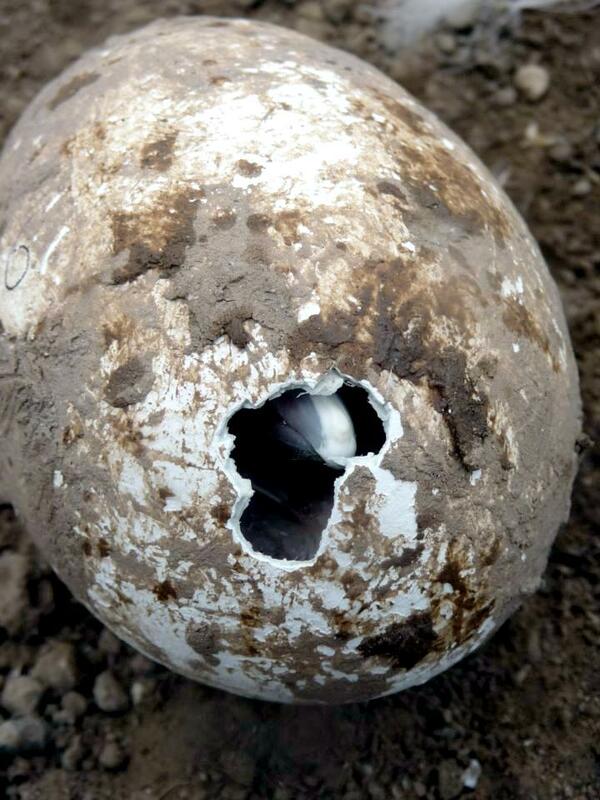 After about 30 days, the egg hatches. 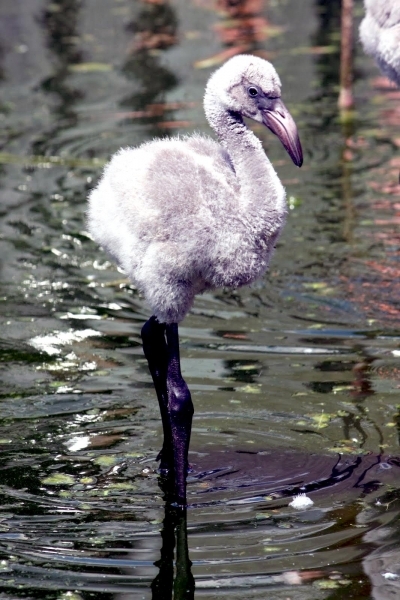 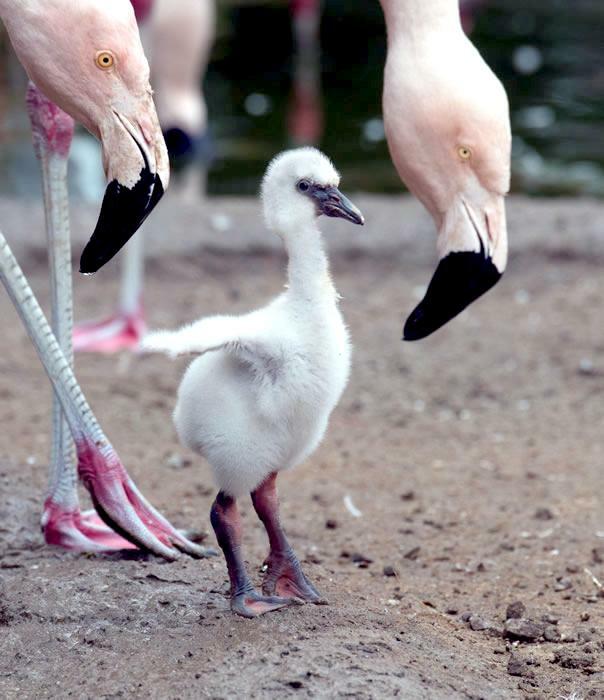 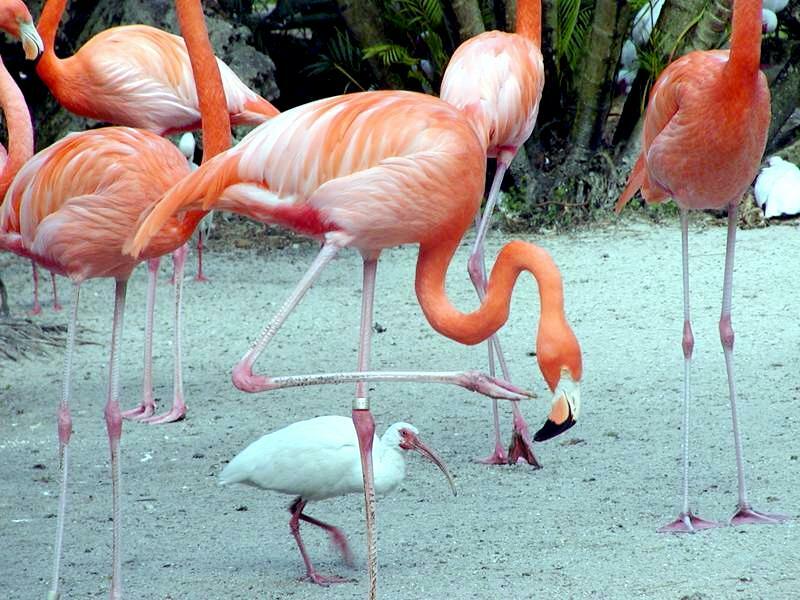 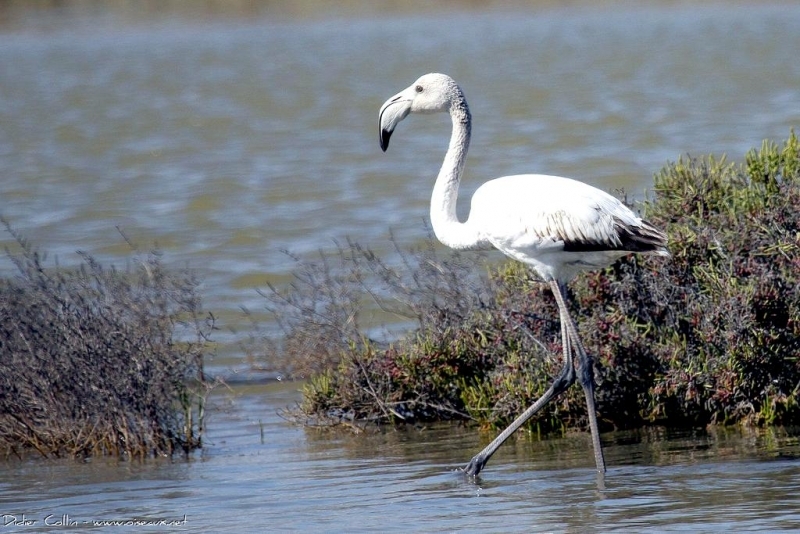 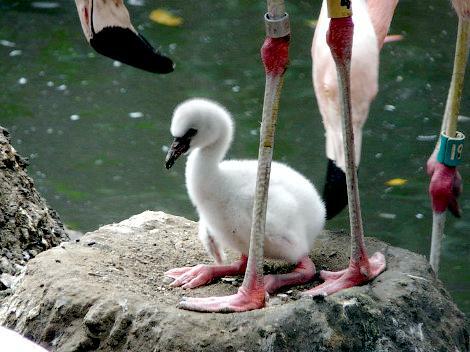 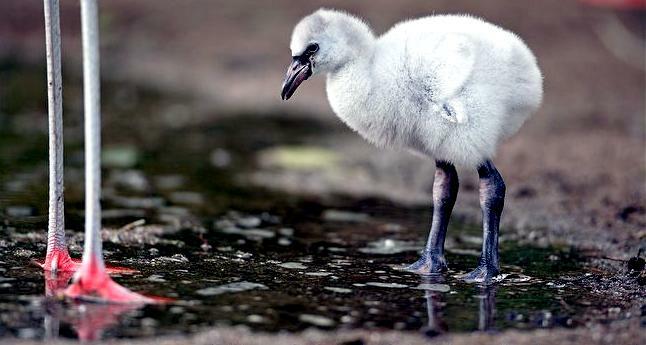 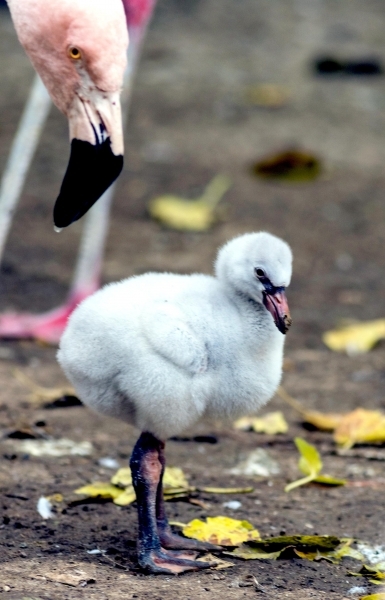 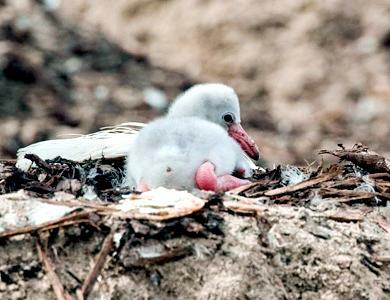 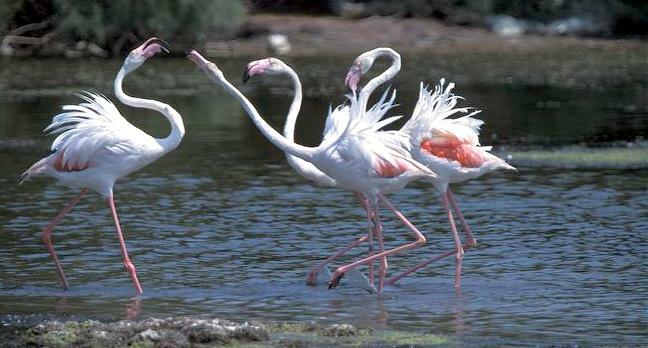 Flamingo young are born white, with soft, downy feathers and a straight bill. 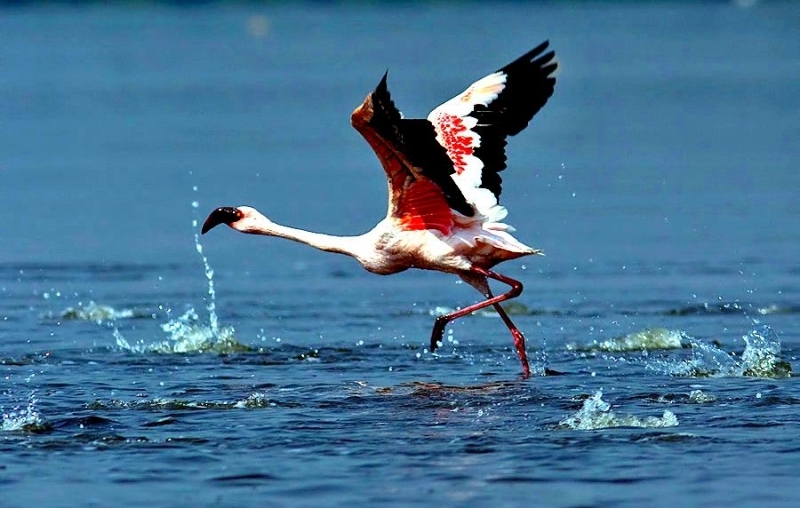 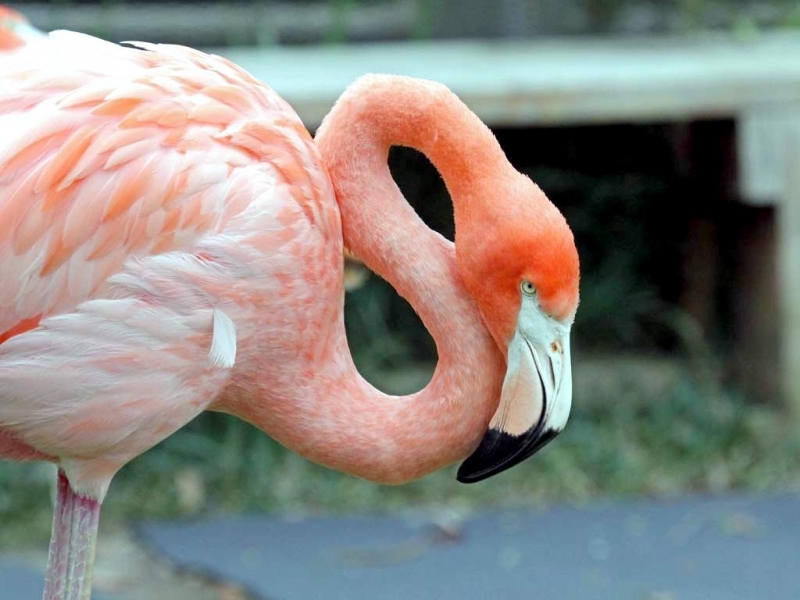 The bill gradually curves downward as the Flamingo matures. 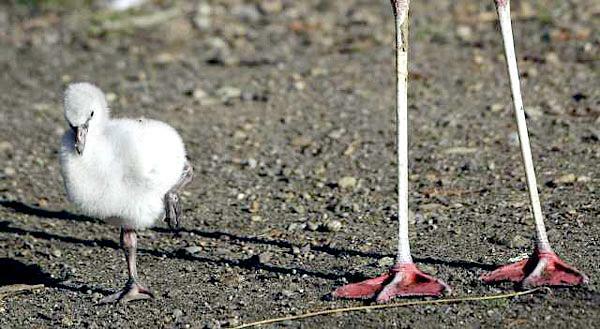 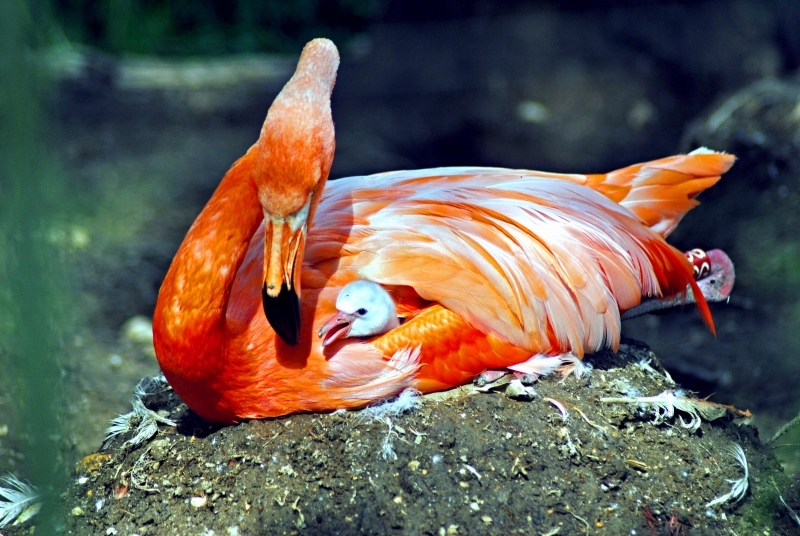 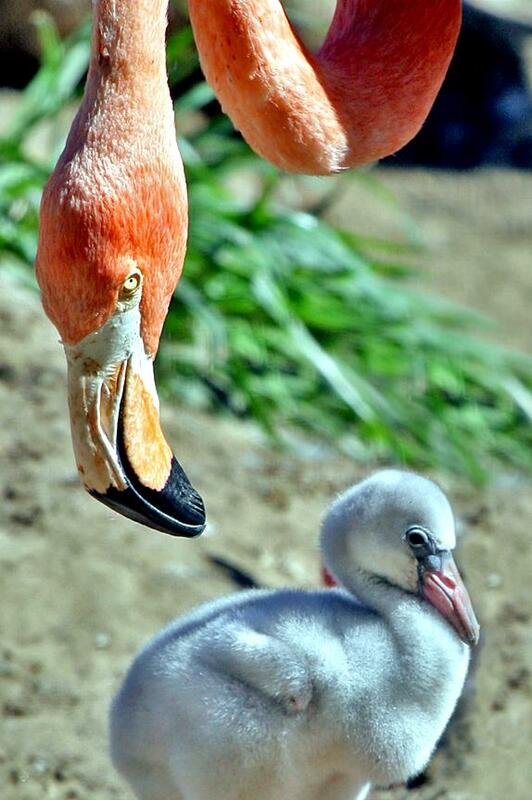 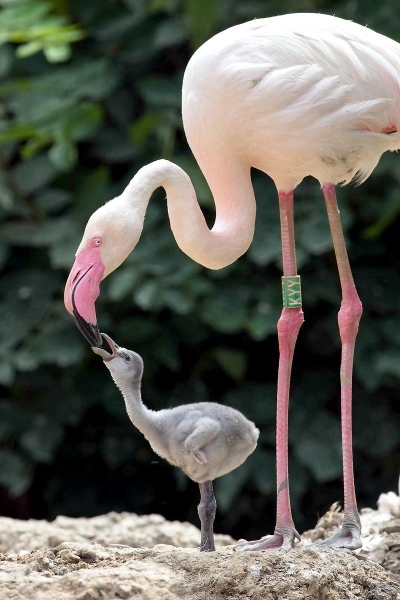 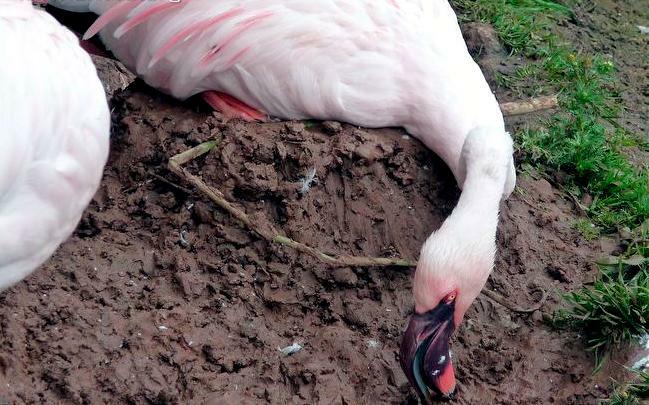 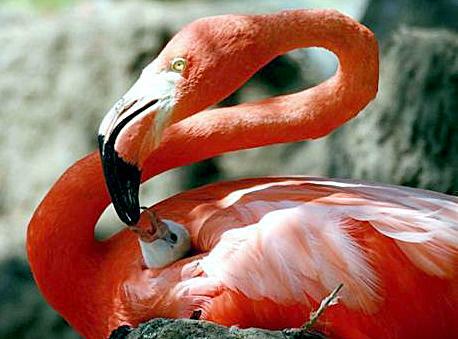 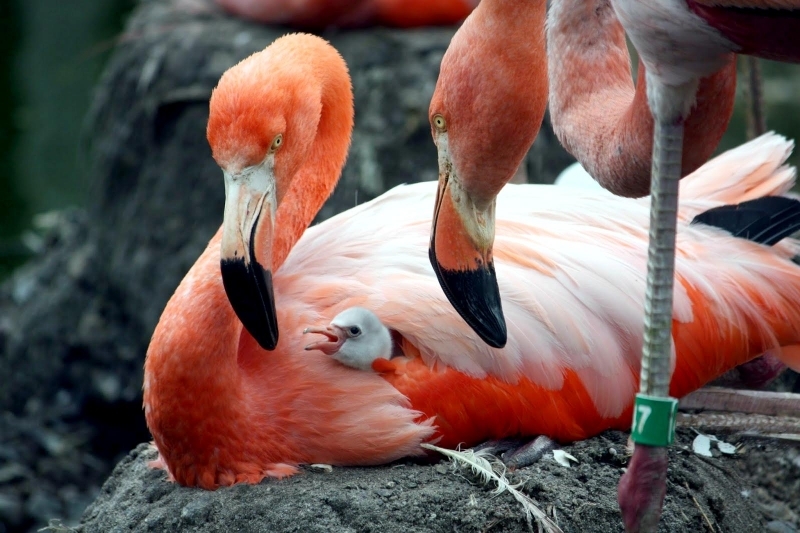 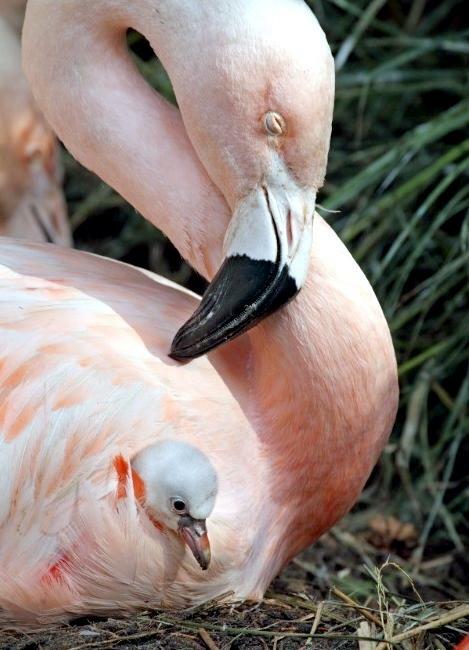 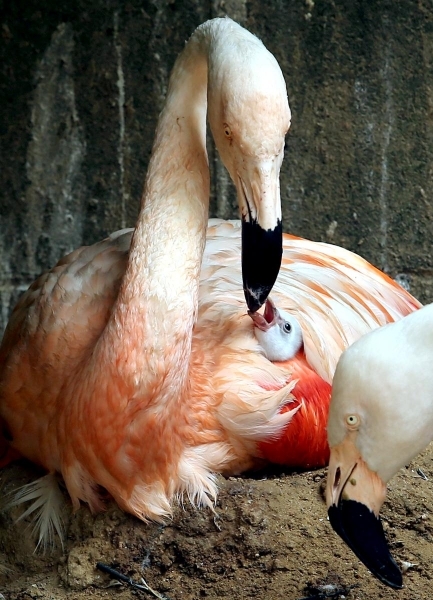 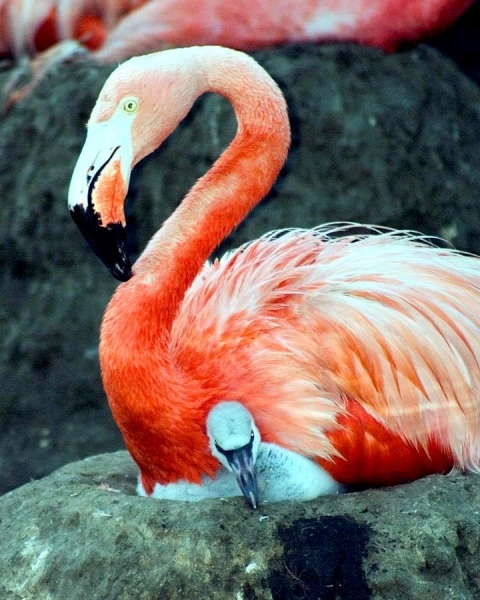 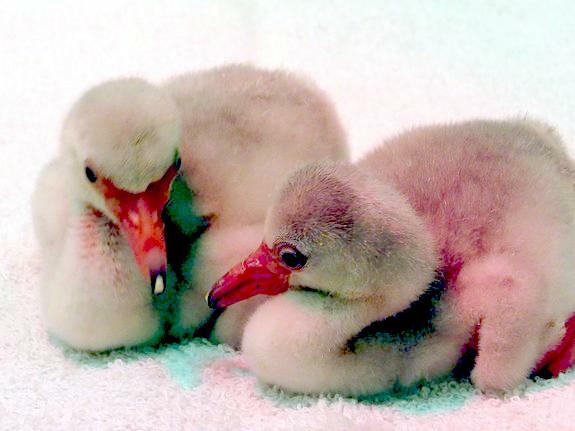 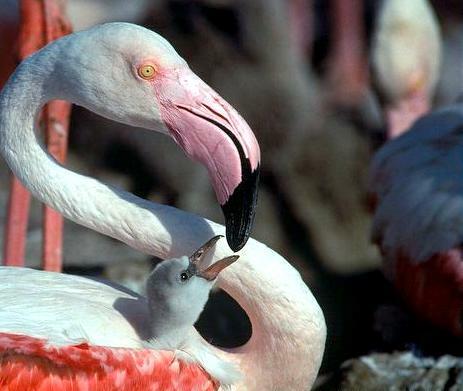 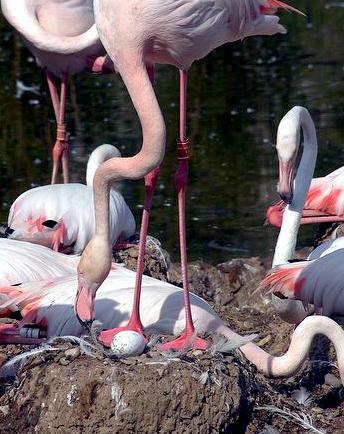 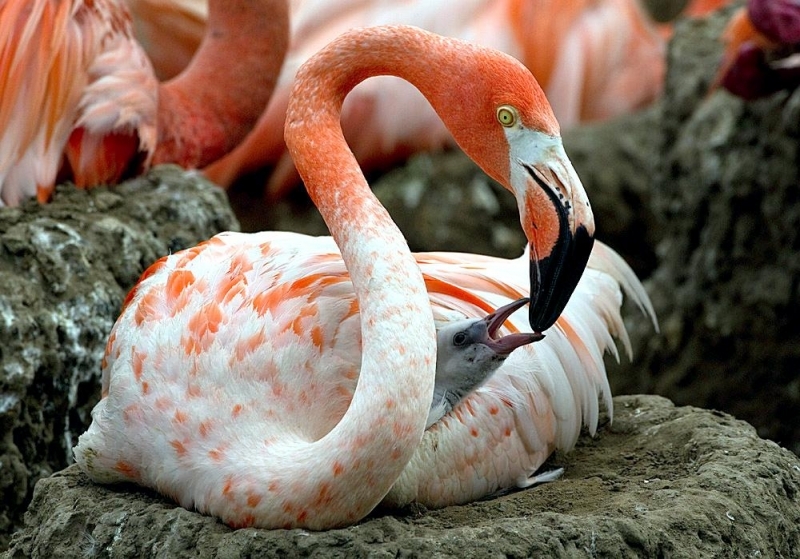 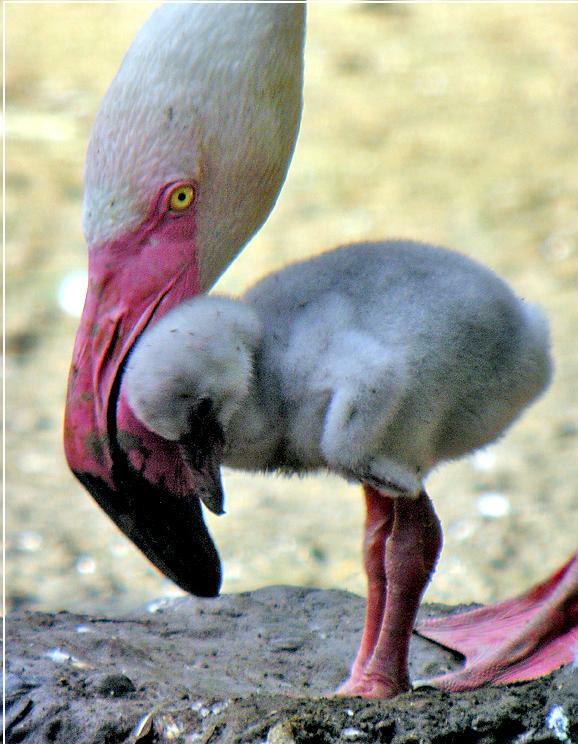 Both parents take care of the newborn Flamingo, feeding it a fluid produced in their digestive systems. 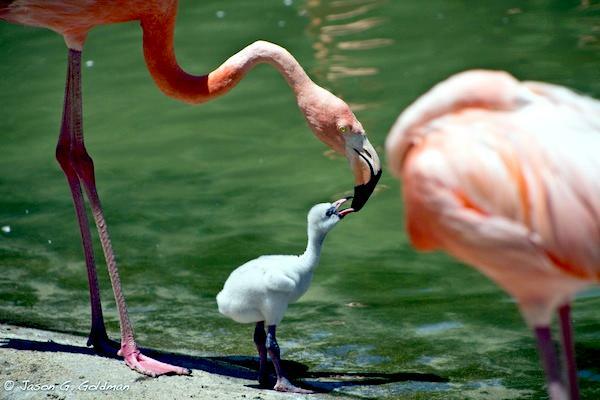 The young leave the nest after about 5 days to join other young Flamingos in small groups, returning to the parents for food. 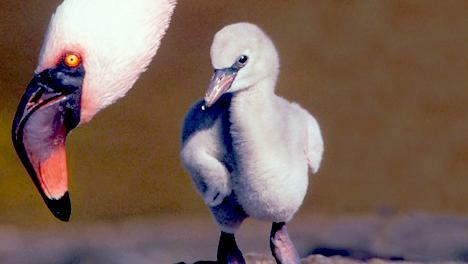 The parents identify their chick by its voice. 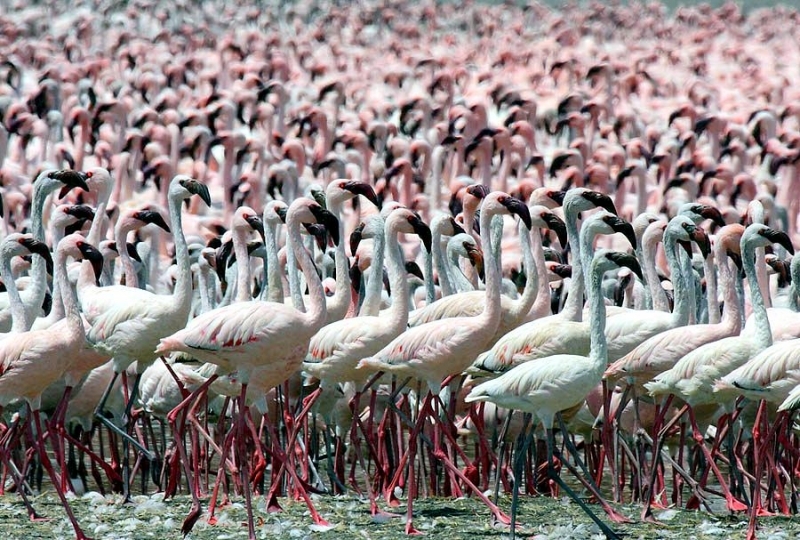 After about 3 weeks, the adults herd young Flamingos into large groups called crèches where they start to look for food on their own. 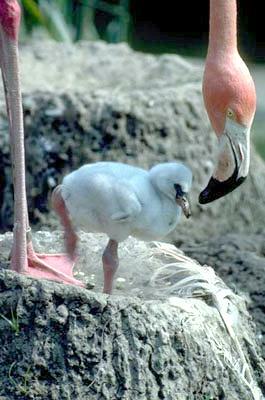 Adult bird is 3.3-4.6 feet tall and weigh between 3.3-9 pounds. 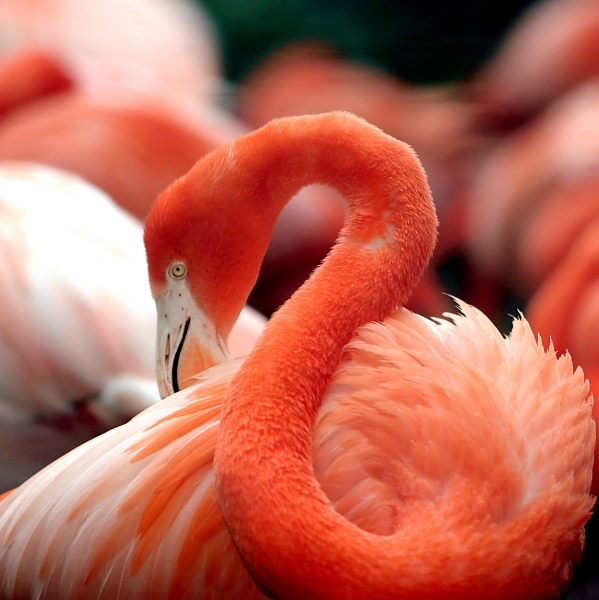 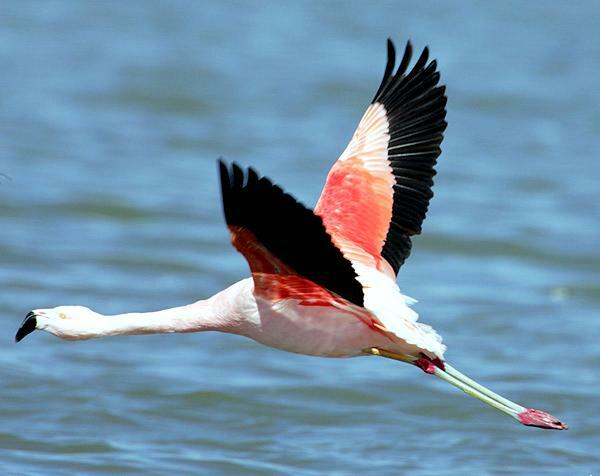 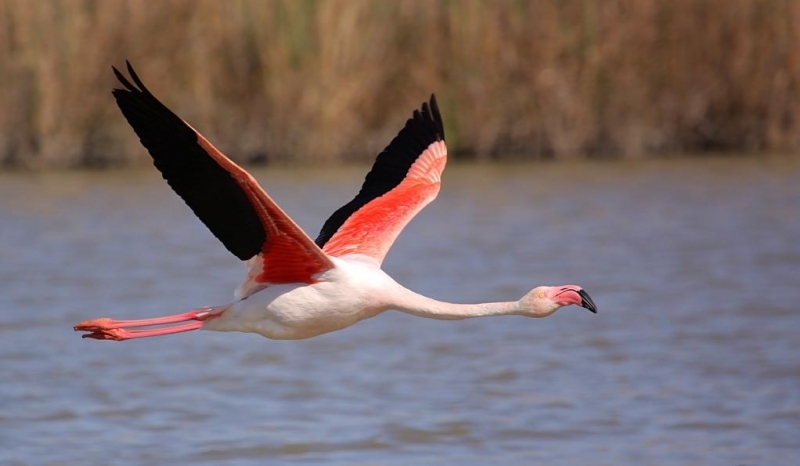 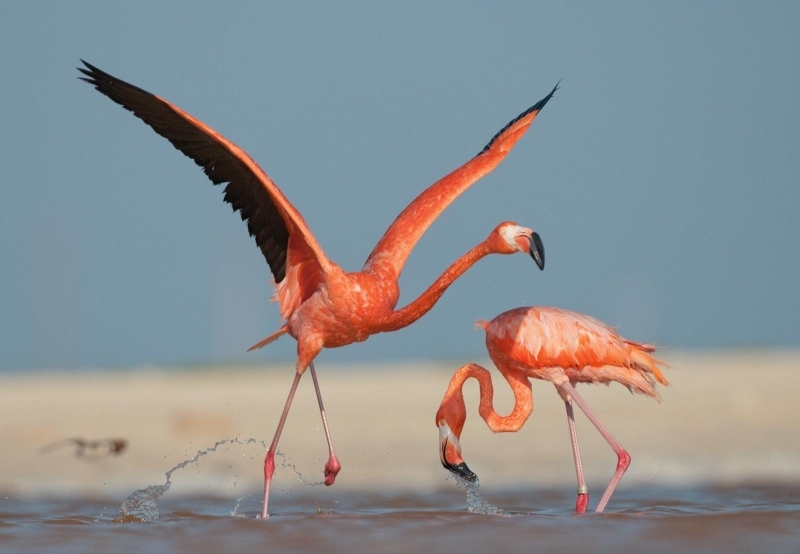 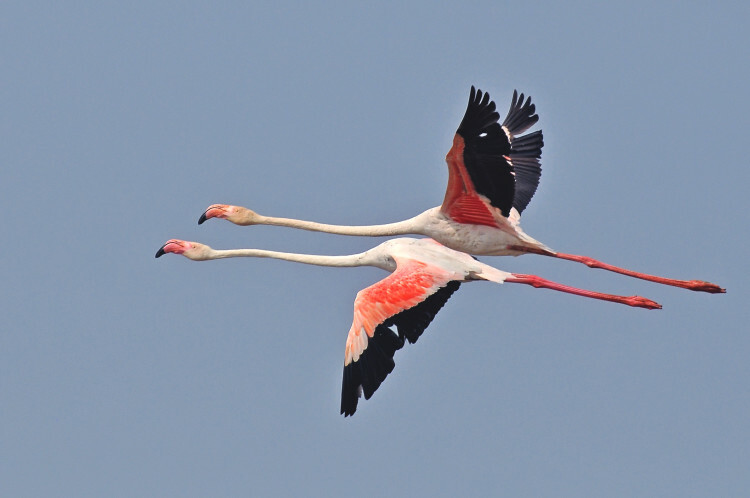 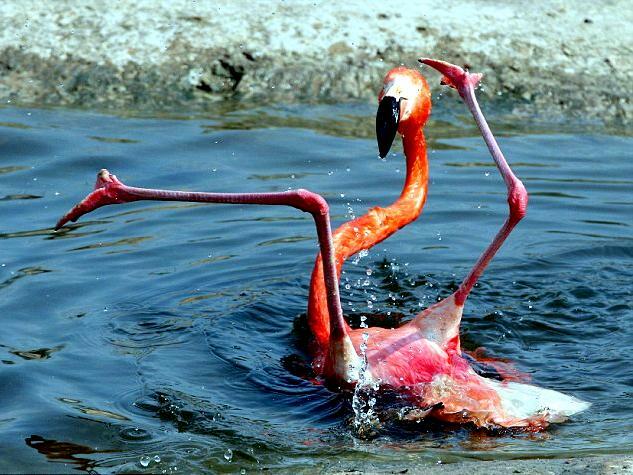 A Flamingo’s wingspan ranges from 3.3-5 feet. 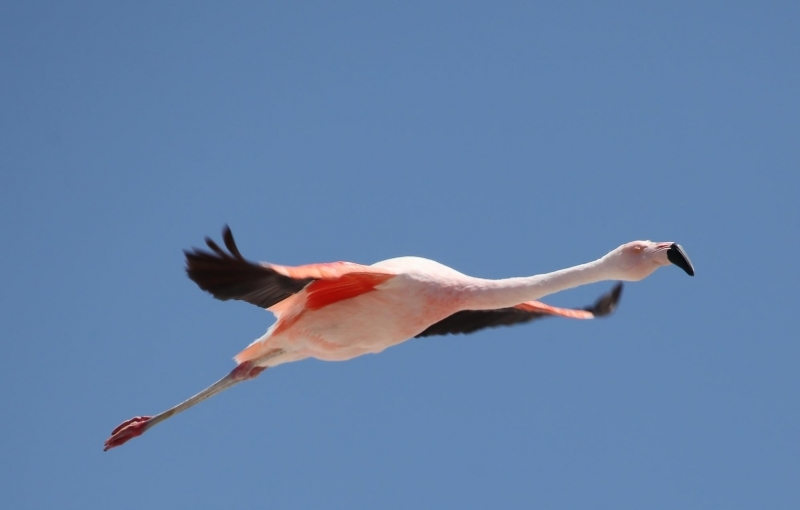 During migration, they fly up to 37 mph and travel distance of over 300 miles to reach their new habitat. 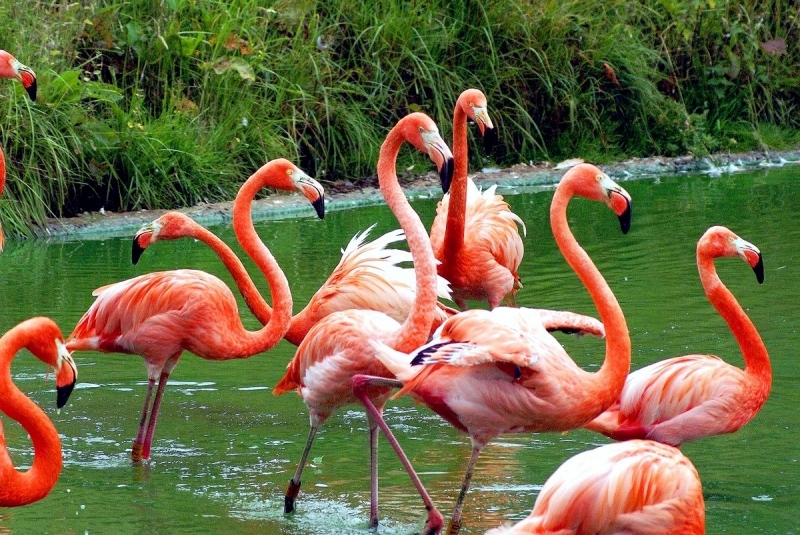 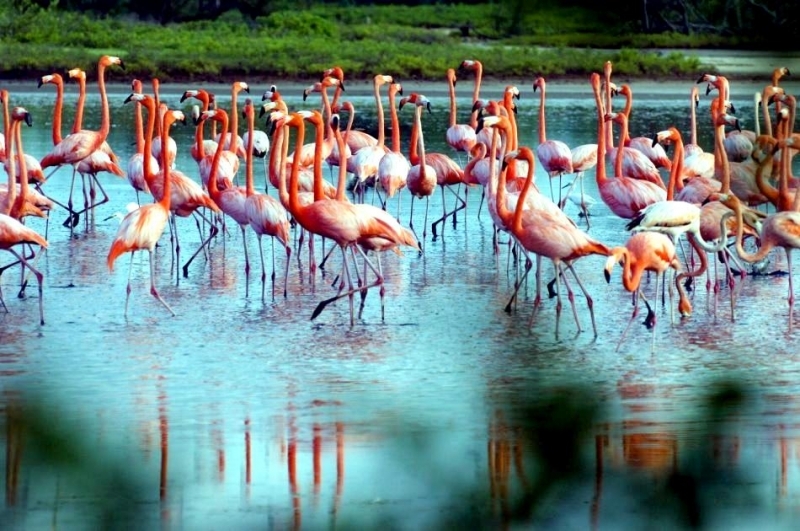 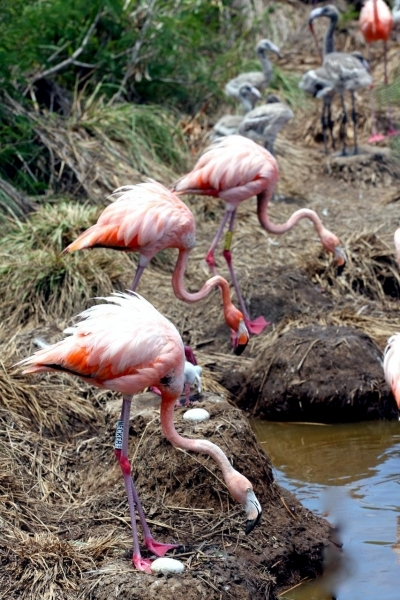 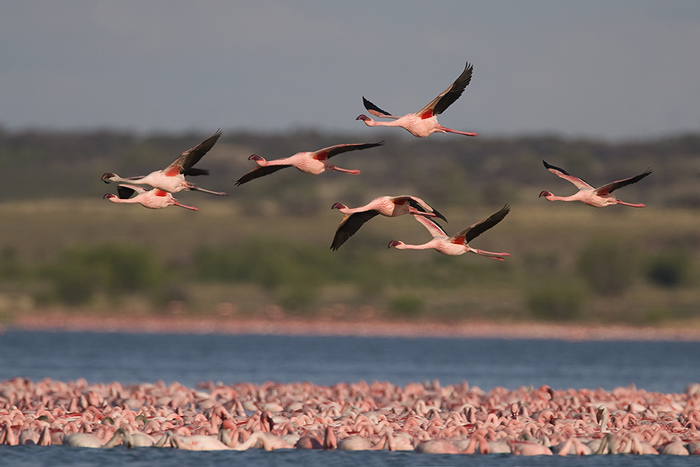 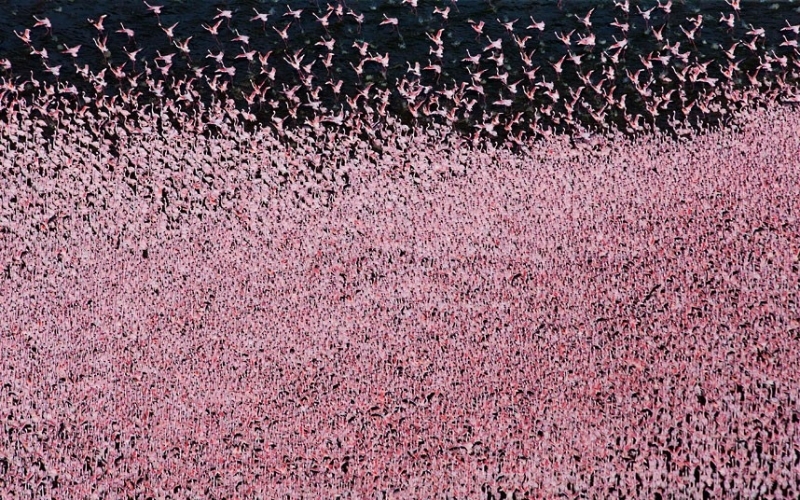 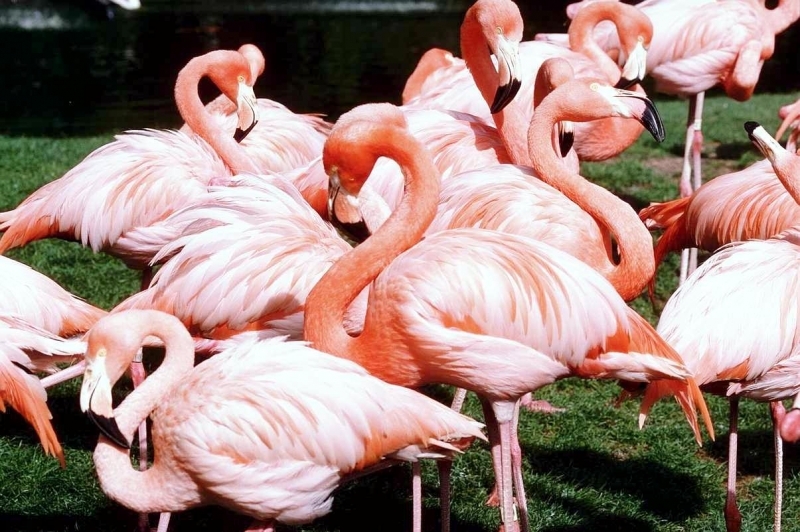 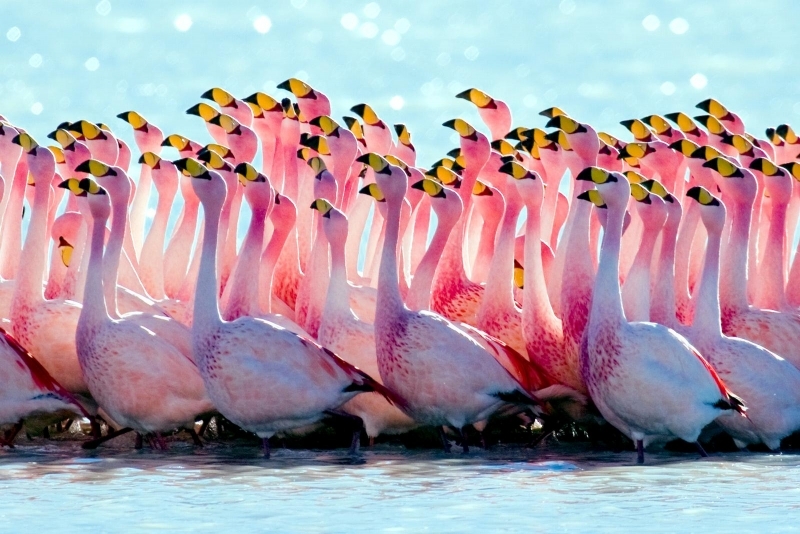 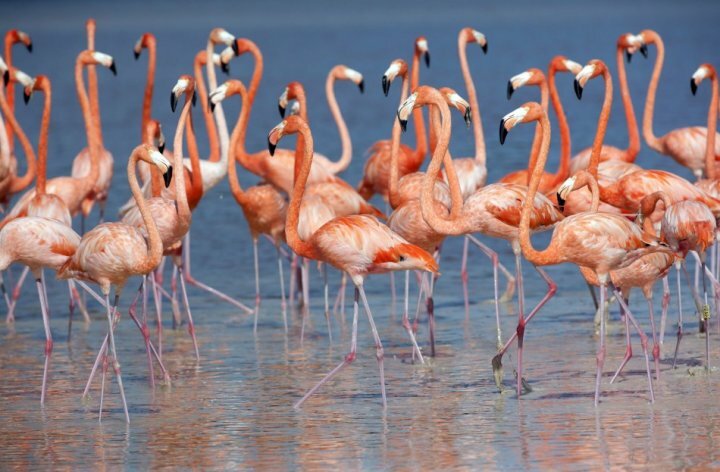 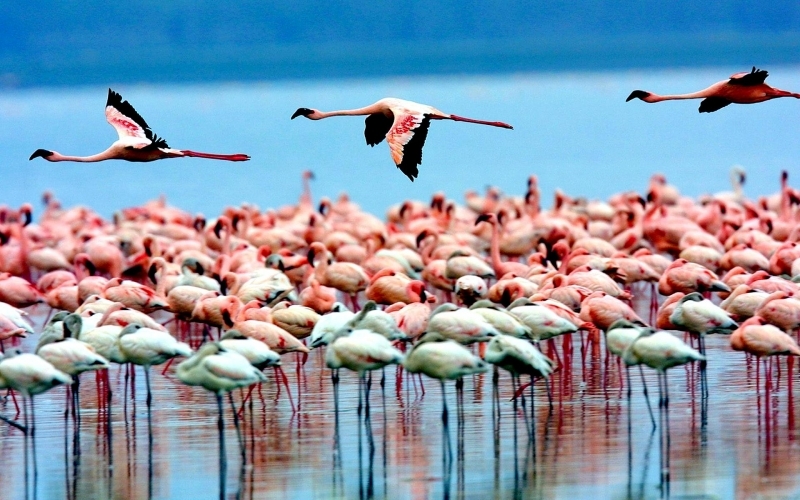 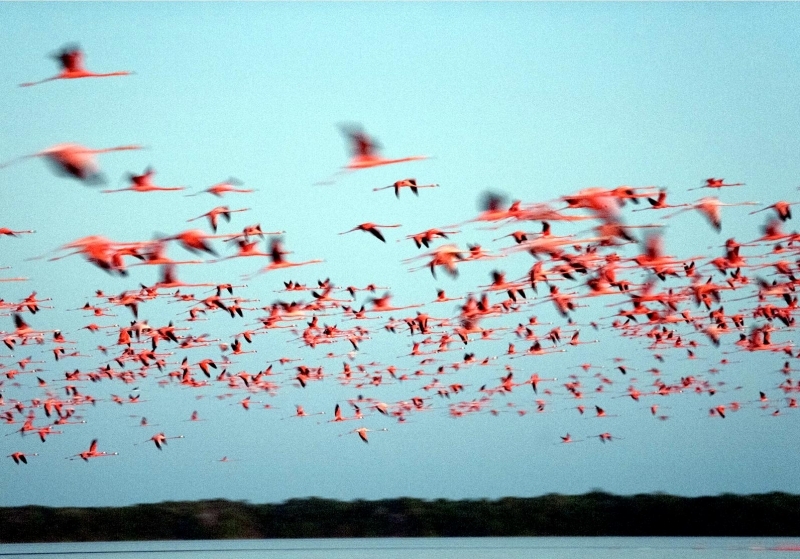 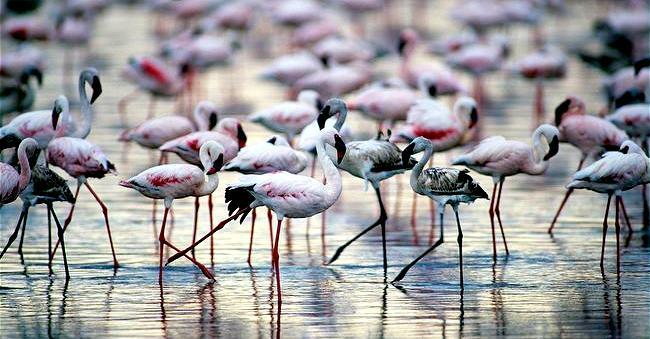 Flamingos live in large groups called colonies. 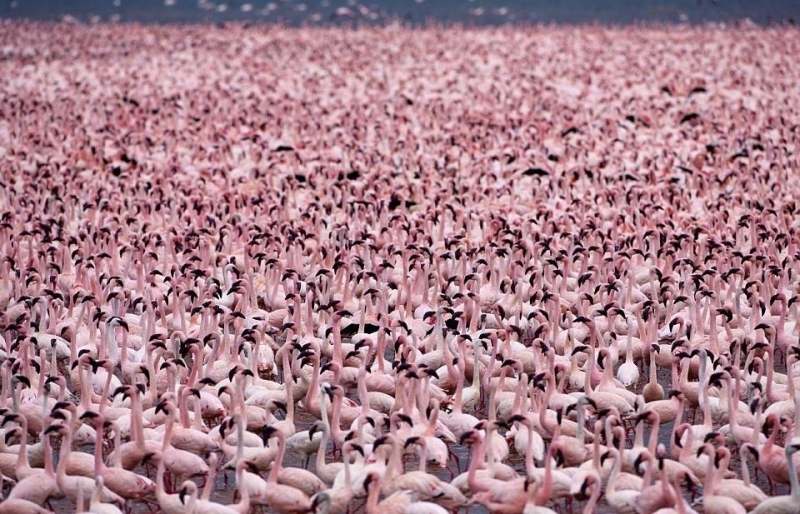 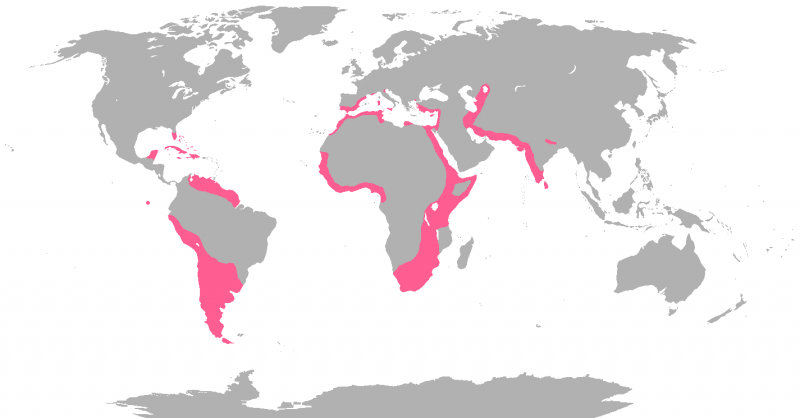 Some colonies consist of over a million birds. 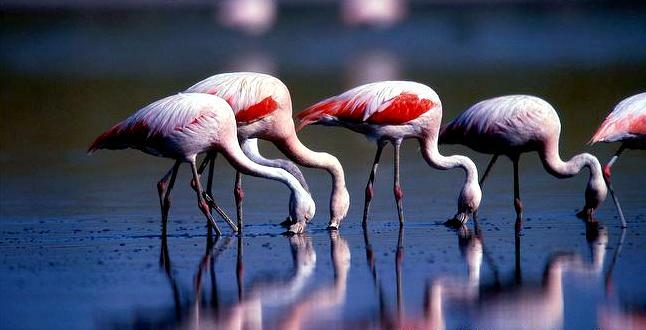 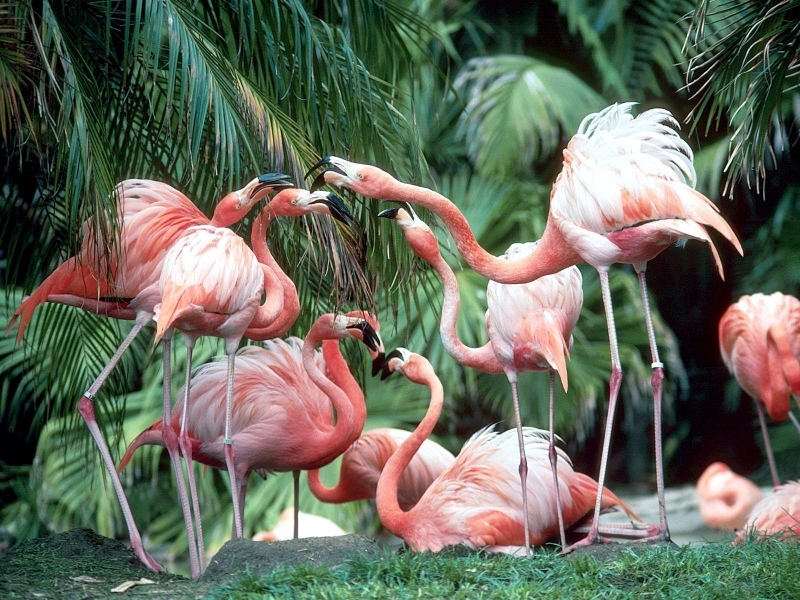 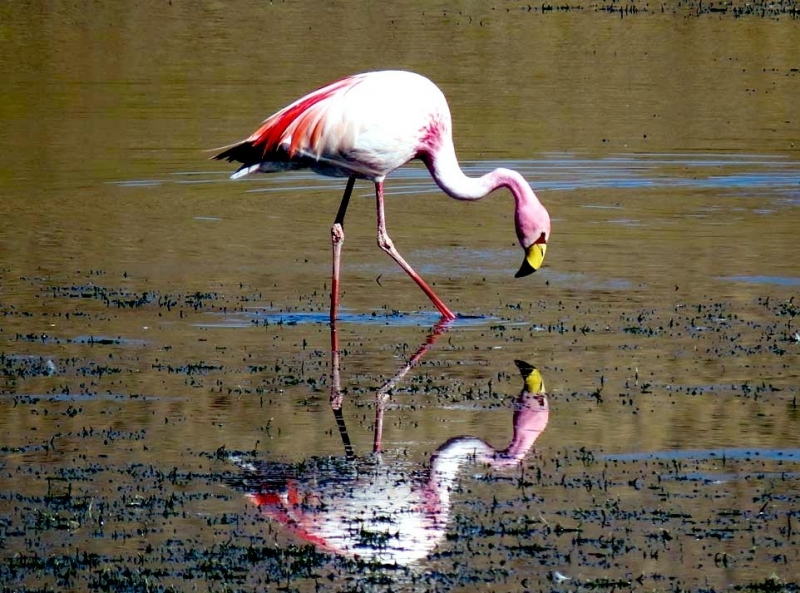 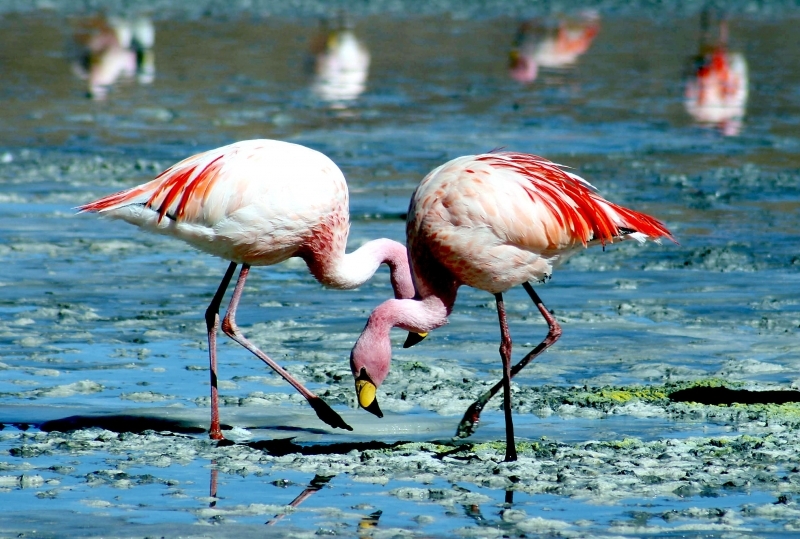 Flamingos are monogamous (they have just one partner) and they produce 1 egg each year. 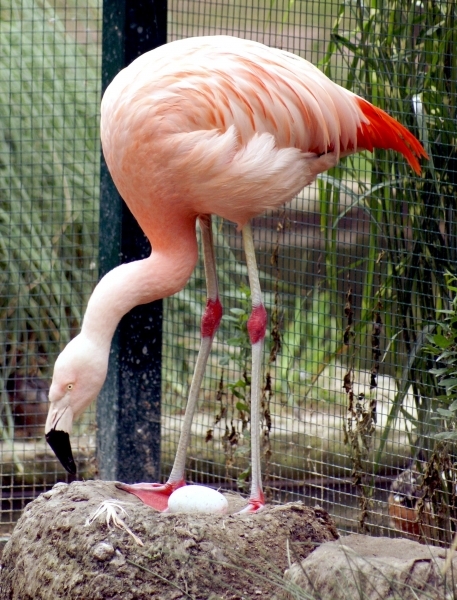 Both the female & male keep the egg warm before it hatches. 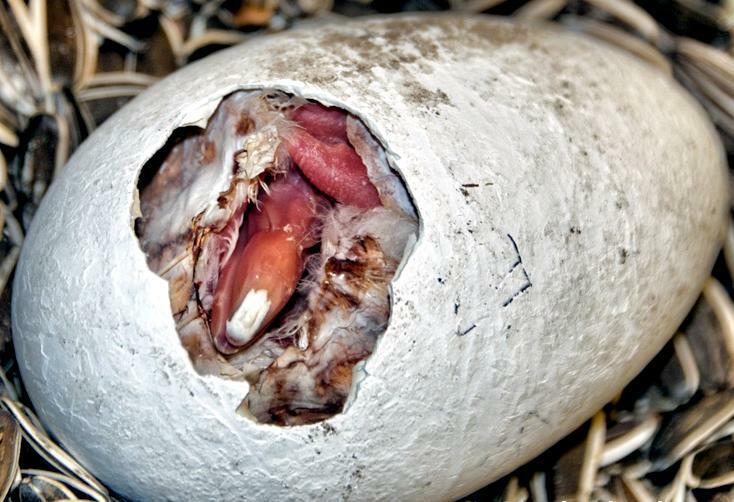 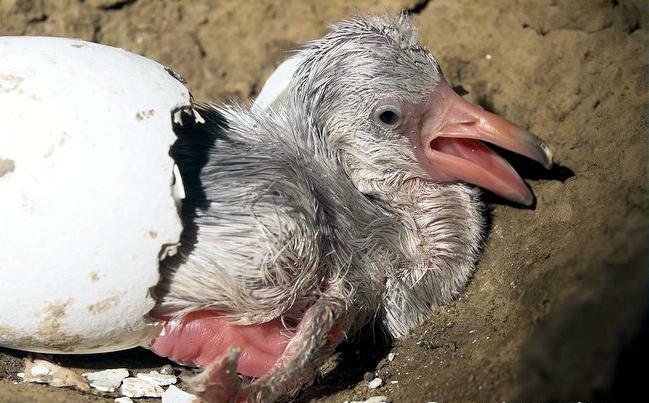 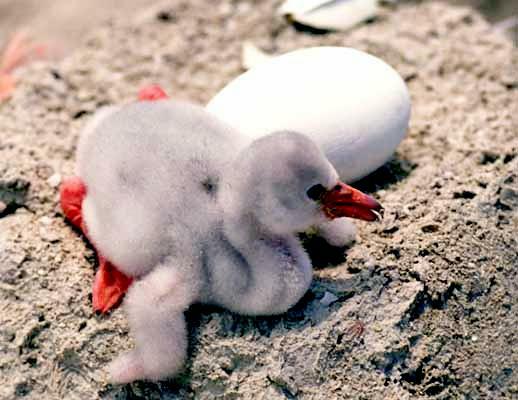 Few days after hatching, both parents will start feeding their chick with milk-like substance rich in fats and proteins. 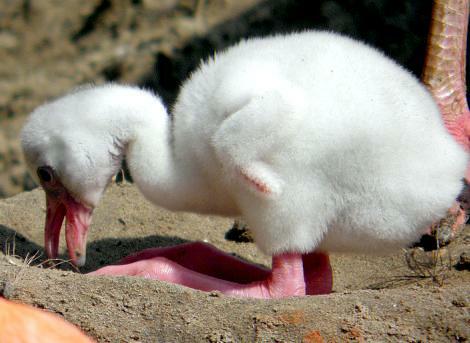 Baby Flamingos don’t have curved bill, it becomes curved after few months. 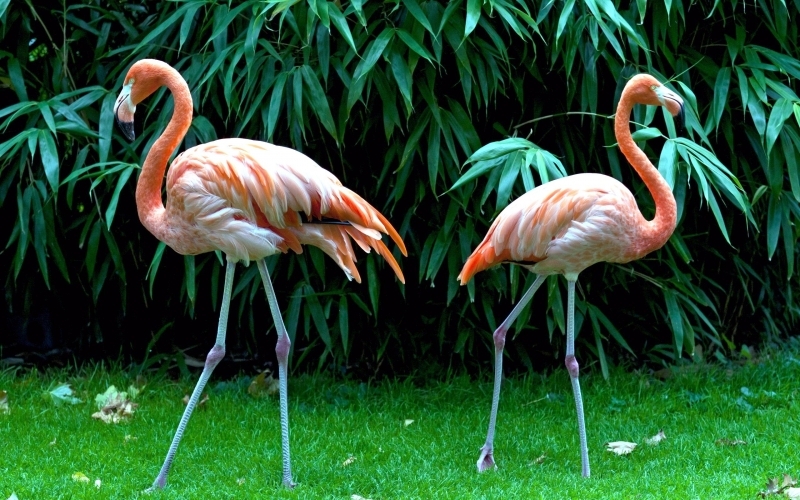 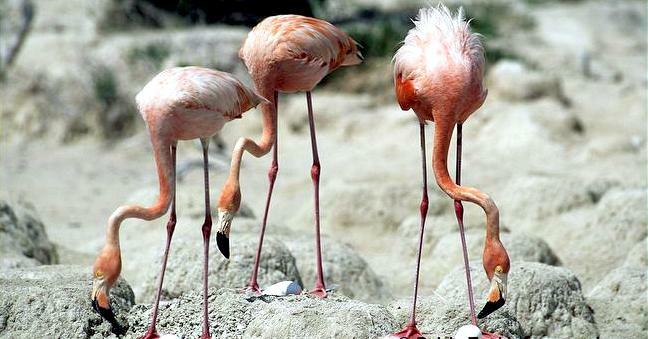 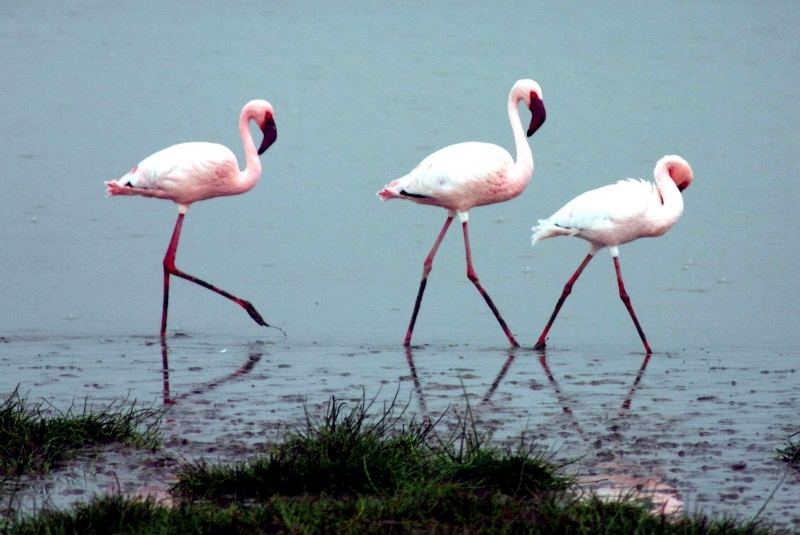 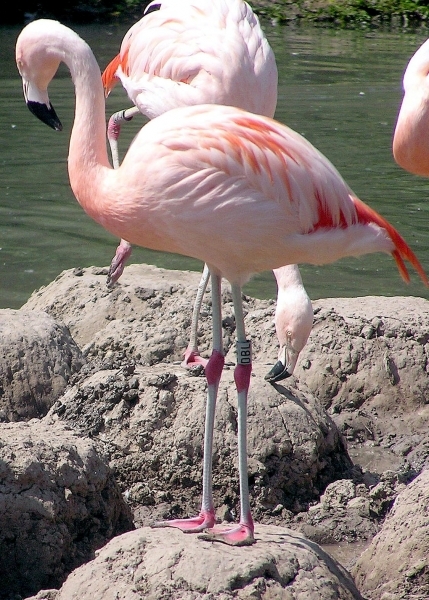 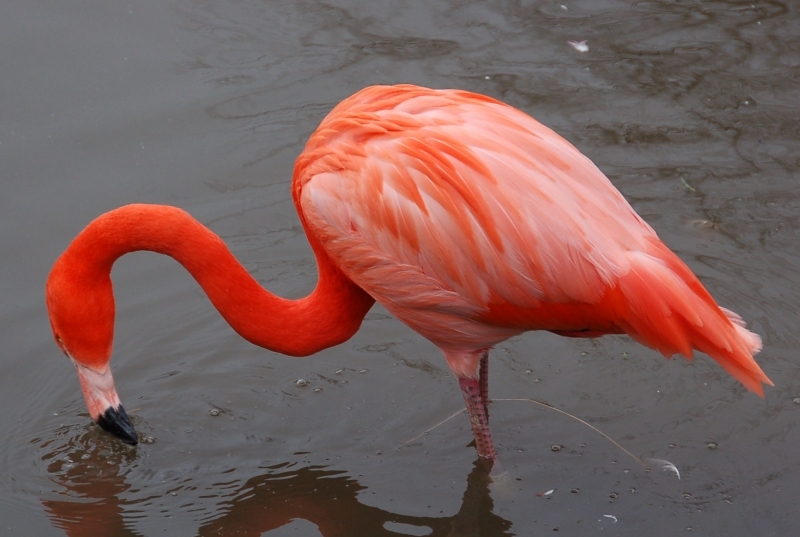 The visible “knee” of the Flamingo is actually ankle joint. 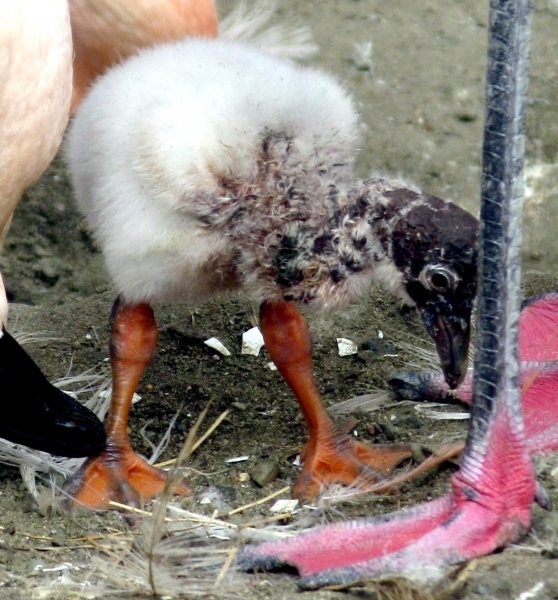 True knee is close to the body and can’t be seen because of the feathers.